There was a lot of hype leading into this game. People were all waiting for our AHGL match against Zenimax. We had managed to go undefeated, and they had accomplished the same feat until the previous week when they fell to Twitch. This was going to be the clash of the titans, and we were super excited to have such fierce competition in the league. The first game started with some interesting bans. They targeted Lux, which made sense because we use her a lot. They banned out LeBlanc which does make perfect sense when you look at my ranked stats. The last ban was targeted at Senor Choppes with a Jayce ban. I could see the logic in all of these bans as we normally play a very poke-based comp and try to wear a team down with the poke from Lux and Jayce, and they didn’t want to experiment with LeBlanc’s trickery. We decided to run double globals. I still wish we would have picked up Pantheon for that triple threat, but with Riven in top lane we knew that we would win that lane for free. 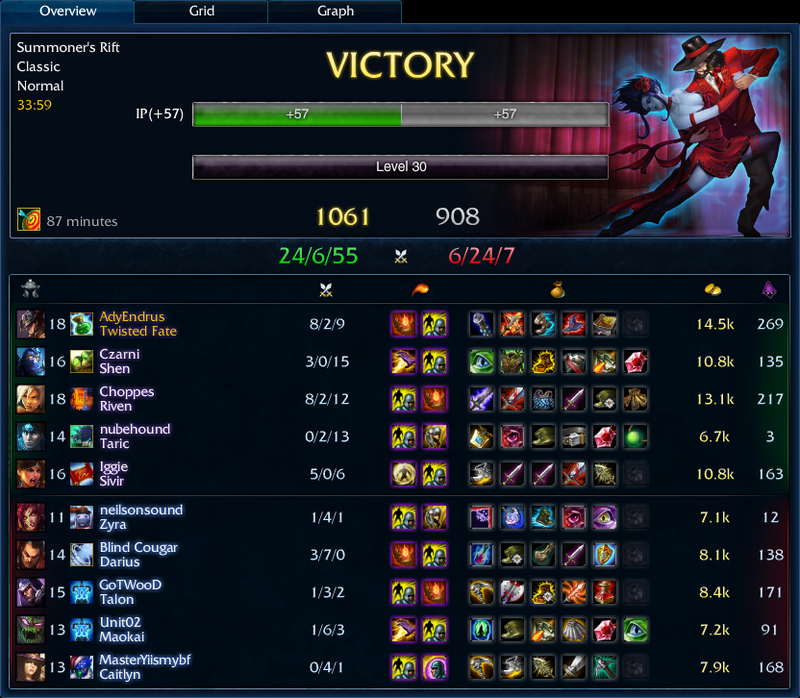 I picked up Twisted Fate and Czarni jungled Shen. This gave us the ability to pressure their team regardless of where they were on the map. However, Unit02 got to pick his comfort pick of Maokai, and GoTWooD got to try to counter pick Twisted Fate with Talon. I’m not sure that Talon is a counter to Twisted Fate. Ultimately, I only have one ability that I can’t cast when silenced, and before Talon pounces on me I can lock a gold card anyway. Plus, my ultimate reveals him when he tries to stealth using his own, and his movement speed boost is completed wasted by the fact that I can teleport to his location after he uses his ultimate. Ultimately, Talon was probably a bad pick, but it just allowed him to be aggressive early. All three games had Maokai camping mid early game. GoTWooD basically got free lane pressure in every game because of his dedicated jungler working to shut me down. It definitely worked early in this first game. I tried to apply pressure bot, but my assists weren’t making my 0-2 score look any better. We started to fall behind in this first game, but just as we were making our comeback nubehound’s computer died. Complete shut down. When he tried to boot he was greeted with a number of errors telling him that he couldn’t boot back up. We were in a bit of a panic. I called nubehound and he asked “Do you have a computer I could play on?” Sadly, I didn’t. I didn’t have League installed on another machine. However, after another restart his computer booted normally and we went on our merry way. It felt like we were starting a second game, because we had waited more than 13 minutes for him to get back online. As soon as we unpaused Zenimax disappeared from their grouping in the mid lane. I saw them heading towards our blue. Nubehound must have seen it too, because he walked over there to see what they were up to. His death pushed the score to 7-6, with us ahead by just one kill. Then the game was over. We started winning some pivotal team fights, and we never looked back. We literally didn’t die after that point. We really got to flex our team work muscles. I did have some fun plays and got to do the Twisted Fate split push thing. Once Twisted Fate gets to that tipping point where his abilities clear out a full creep wave he gets very entertaining to try to play against. I actually had Maokai, Darius, and Talon chasing me to stop me from split-pushing, but while they chased me down bot lane my team took middle inhibitor and then I chased Darius down to hear the announcer yell “Legendary!” Oh how I love that sound. The second game never happened. Katarina got to spiral out of control and pick up kill after kill. It got to the point that we should have just surrendered. We had a few ways to take Katarina out of her ultimate, but Katarina isn’t built around that ultimate anymore. She can lane with just health potions, and she never has to leave lane and Xerath has no kill potential against her because of her Shun Po. 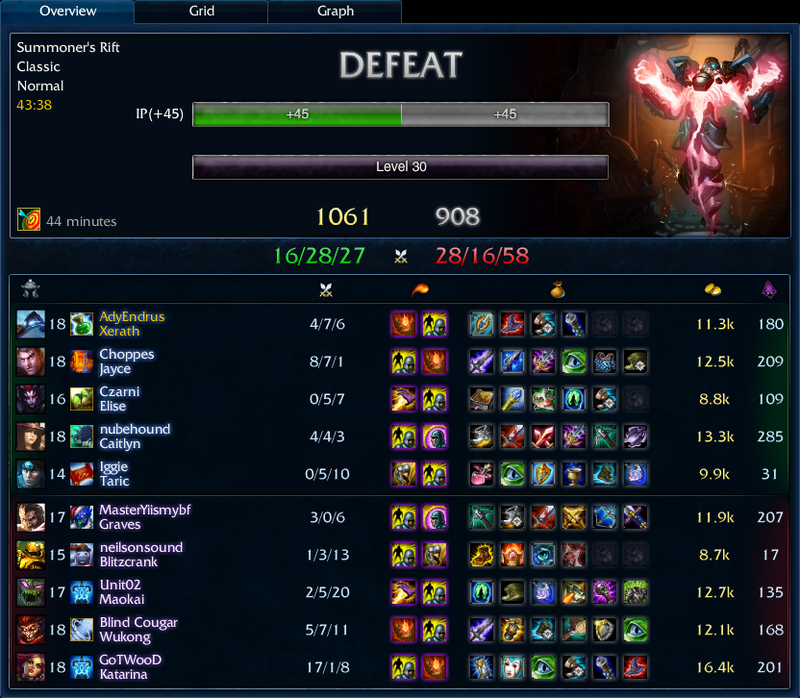 Again, GoTWooD got a free counter pick against me after they banned out LeBlanc and Twisted Fate this game. This game was a total flop. We decided to go poke comp because we had the Jayce and Elise picks both up. I picked a super harassing mid with great poke and then our ADC was Caitlyn, so we had good poke from our AD with good disengage with her traps. For support we probably needed another way to put pressure on the enemy team, like a Zyra, Morgana, Blitz, Thresh, or any other champion that has a long skill-shot ability. Instead, we got Taric, a melee, aura-based champion. It just didn’t fit the play style of poke. However, Zenimax had the chance to counter pick our poke with WuKong and Katarina anyway. It didn’t look like a game we could win, because we just wouldn’t have the tools to deal with their dunk engage. This leads us into the third and final game of our best of three series! Going into the third game we knew the pressure was on. We had to win to keep our undefeated streak alive. For the third game we again saw LeBlanc, Twisted Fate, and Lux bans. They really didn’t want to have any fun with my mid champs! 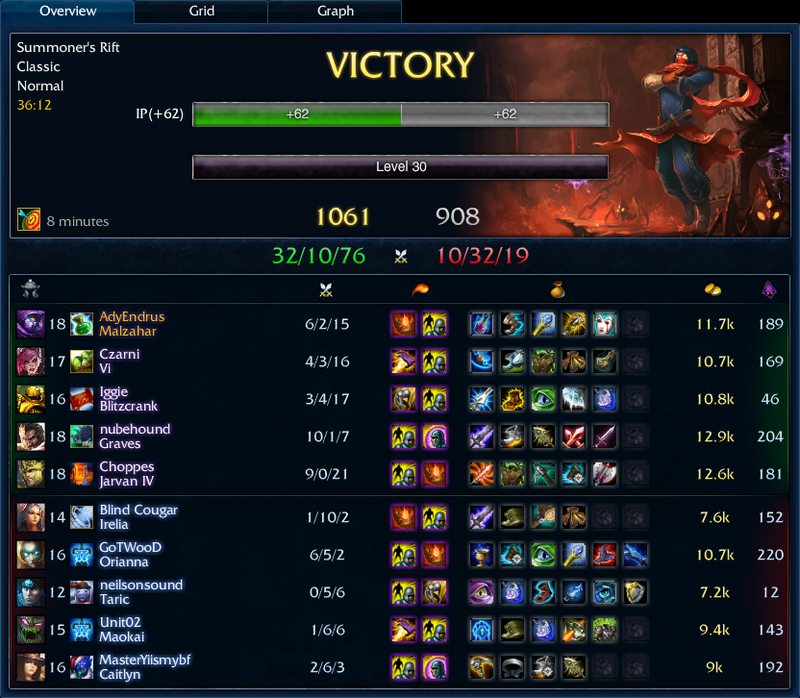 Also, for the third game in a row I let GoTWooD counter pick me. When he picked Orianna I breathed the largest sigh of relief. I don’t know where people are getting that counter pick information, but this wasn’t the first Orianna to get picked against my Malz. Oh and I love the match up. Of course, Maokai camped mid again. I actually walked over to ward the bushes at level three and thought better of it, so I walked around and warded over the wall. Of course, Mao was standing right there. He eventually left, and just walked around to the other side of mid. That’s when Czarni got sandwiched between Maokai and Orianna and gave up First Blood and gave Orianna Red Buff. Oh fun! This was just the tip of the ice berg for where this game was going. We started spiraling down hill fast. This is where my lane opponent was when the game was looking most grim. That’s a 6-0 kill stealing Orianna ruining my fun in mid lane. I guess GoTWooD wanted a repeat of the previous game, but we weren’t going to let that happen. It was at this point that we knew we needed to rally together and start putting pressure down on the map to get the global gold lead back in our favor. We grouped in top lane and started to fight back. Very quickly we got ahead and started flexing our muscles in team fights. The next time we forced a Dragon fight we went into the battle up, 8-13, and left at 8-18. The game didn’t get much closer than that, as we finished 32-10, but in the final moments of the game Choppes called out “SNIPE BLITZA!” which was a request that Caitlyn more than obliged to fulfill. Czarni dodged the bullet to make sure that Blitzcrank would die to the Caitlyn ultimate. It was so funny to watch. It was a humorous ending to a true show of teamwork and rallying under pressure.